Immerse yourself in an extra-dimensional media experience with DreamScreen. This set of LED strips is designed to work in tandem with any HDMI-compliant TV, and create a colored, ambient glow, that will match what you're watching, playing, or listening to - in real time. Simply stick the strips behind your TV, and in video mode, the LEDs will react to the color pixels of what's playing at up to 60 frames per second. This renders a color-matching backlight as you watch, so it feels like the image is spilling right into your living room. Additionally, the music mode offers 4 different audio visualizer profiles to choose from, so you can watch the LEDs dance to your favorite beats, creating a light show that matches your music, and the ambient lighting mode lets you silently set a customized color and brightness scheme for any room. Choose from the pre-loaded scenes, or build your own, and change the feel of an entire party. 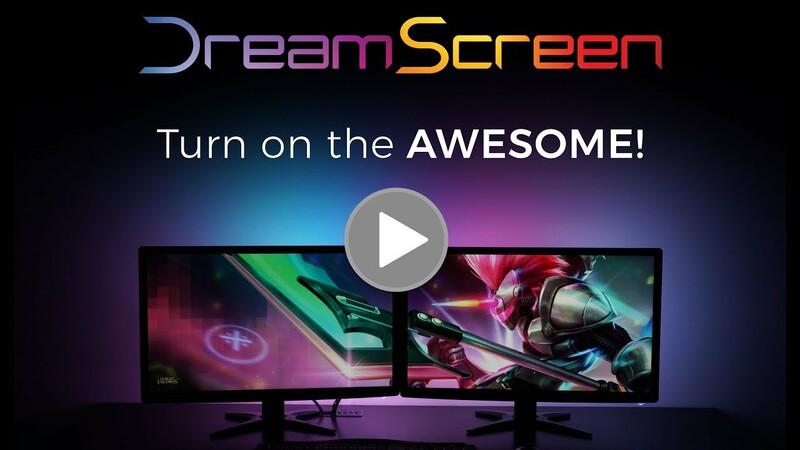 DreamScreen works with both wall-mounted and table standing TVs, and the LEDS are programmed to change at the same frame rate as your TV when it's on, so the lights, picture, and audio are always in perfect sync. Easy to install and totally customizable, your favorite movies, music, shows, and video games just went to the next level. NOTE: DreamScreen works with external sources using a pass-through system with an HDMI splitter. Because of this, internal/smart TV apps will not function with the LED lights. If the estimated ship time seems a bit long, it's because many items are shipped in bulk at the end of the sale (on Jan. 20), which is what affords you the discount. Some items are also made-to-order and/or are shipping internationally. The best things are worth waiting for!